There's a lot of pain in Israel and a lot of rage, but NY Times reporter Nicholas Kristof found something else. I'll be offline until Sunday celebrating a somewhat (and undeservedly) obscure Jewish holiday called Shavuot. * It celebrates the giving of the Torah on Mt. Sinai - a story I love not only for its religious importance but also because it sounds like such a wild light show. 16. It came to pass on the third day when it was morning, that there were thunder claps and lightning flashes, and a thick cloud was upon the mountain, and a very powerful blast of a shofar, and the entire nation that was in the camp shuddered. 17. Moses brought the people out toward God from the camp, and they stood at the bottom of the mountain. 18. And the entire Mount Sinai smoked because the Lord had descended upon it in fire, and its smoke ascended like the smoke of the kiln, and the entire mountain quaked violently. You know I'm not a Bible quoter but this is just so great and dramatic - isn't is? Anyway I'll see you Sunday. *OH and the cheesecake is up there because this is a holiday that is, traditionally, heavy with dairy meals. Wow. One of my twitter feeds just posted this link: Jews Unwavering in Support for Obama. It's a Jerusalem Post story but citing a Gallup poll, reputable and usually more conservative than other top-level pollsters. Welcome to Tuesday Tours. There's so much good stuff out in the Blog Universe; we all have our blog readers filled with those we love. It's tough to keep up though, so until further notice, I'll be offering Tuesday tours of some of my own frequent favorites. One of my favorite bloggers, Pundit Mom, offers posts at two ends of the spectrum as the week begins. Both are worth reading. The first: advice to the Obamas about the neighborhood around Sidwell Friends School. It's just fun. The second is a serious post with a serious question: When is it right to tell an airline official that a passenger is making you nervous ? Concerned about what's going on in Israel? Check back daily at Writes Like She Talks, where Jill Zimon has her finger on what's up all over the Web. Here's a sample. Also "generationally speaking," you know that all last year I wrote comparing 1968 and 2008. Well, Time Goes By columnist Saul Friedman has done me one (actually two) better, writing of lessons from his own iconic president, Franklin Delano Roosevelt, and Obama's point of reference, Abraham Lincoln. Beth Kanter is a legend. Rightfully so. So when she offers 52 ways for Non-profits to use social media efficiently as a New Year's gift to her readers, I'm figuring that at least some of them can help the rest of us too. Two of my favorite moms have something special too: I'm late on this one, but Her Bad Mother's description of a willful three-year-old (it's long so wait until you have time) is priceless. Some kids are just strong strong little people. Also, Woulda Coulda Shoulda's Mir Kamin celebrated her son's last single-digit birthday with a wonderful hymn to a newly-nine-year-old. She never misses, that one. Finally, this one - because the happy family in the photo is mine. This carnival is fascinating - many sides of issues relating to Judaism, observant or secular Jewish life and, of course, Israel. It's pretty diverse, take a look and see what you think. Full disclosure: a post of mine is included. Every decision my parents ever made was influenced by the Depression. What we ate, what we wore, where we shopped, when and how we took vacations, what we "needed" vs what we "wanted" and, in their own lives, what careers they followed and where we all lived. They had been teenagers in the Depression, and although both went to college (on scholarships and several jobs at once) neither studied what they'd wanted to. I've talked about all this before - my mother refusing even to talk about her life then, my dad so concerned when any of us made a job change or took any professional risk. I felt it too. I still read menus from the price to the item, skipping the ones that are too expensive. Ditto with price tags on clothes. I've always clipped coupons and bought things on sale, shopped at big box stores and always, always read the unit prices of things. And, as an American Studies major I took several courses dealing with the Depression. I needed to know more about it not only as a student but as a daughter. 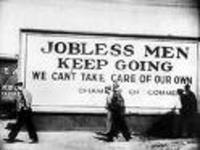 I know that this is not the Great Depression. I know that there are more protections in place, even if too many of them have been removed in the past eight years. But the economic chaos of the past week has been scary on more than one level. Of course I worry about us, getting near retirement age. But my bigger worry is the impact such a colossal change will have on the lives of the younger people we love. Our sons, first of all, at the beginning of their careers. And all the families in this community who mean so much to us - just starting families and facing years of tuitions and outgrown winter coats and activity fees. I also think about just-retired or nearly retired "elders" so well represented by Ronni Bennett's blog, and all the people living from paycheck to paycheck -- who will be endangered by cuts in hours and devastated by the loss of their jobs. And this is where Sarah Palin comes in. And John McCain. Because every day the level of negative language rises, the indulgent response to enraged constituents yelling things that should not be spoken in an American election or any other time: threats and bigoted characterizations and more. This kind of language is far more dangerous in a bad economy. 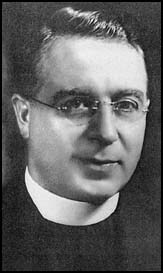 Hitler was successful partially because the German economy had so badly frightened people, men like "Father Coughlin" (that's his picture) preached racism and anti-Semitism on the radio during the Depression with substantial response. There other, less prominent hate-mongers too - and they had a real following. People needed someone to be angry at and were vulnerable to that sort of demagogery. It's a very scary shadow over the economic crisis, the campaign, and the souls of the American people. NOW, go read Josh Marshall on why the ghost of Father Coughlin haunts him, too. And read this very thoughtful post about a tough electoral decision. The consider what sort of leader allows such things - and doesn't stand up and tell his/her supporters to cut it out? What does that say about their leadership once they're in office? The lights were out; all that remained were small spotlights where the readers sat. It was a day of sorrow and mourning, so we spurned comfort and, as tradition dictates, sat on the floor. In front of the Sanctuary, the readings began: Eichah - Lamentations, the prophet Jeremiah's horrifying account of an ancent time of soul-shattering misery. Reading it aloud is part of the holiday** but, since I was newly observant, it was previously unknown to me, as was the enormous impact of the dimly lit room and haunting content and trope of the reading. That first time, just three years ago, I didn't have a clue what was coming -- that night or the next morning, when the readings continued. This is a lot of sadness (and foreboding of more to come) to have taken place on the same date. So it's fair to observe a period of mourning and remembrance. What happened to me, though, was that the language of mourning is so fierce, so hideous, and in some ways, so applicable to what we see happening around us now, that it is almost unbearable to listen to. And so, the first time I heard it, I fled in the middle and went across the hall into the childcare room. My sweet, ridiculously smart friend Aliza, with her infant daughter and unable to join the prayers, was off to the side praying on her own. In tears, so troubled that I was trembling, I interrupted her prayers, something I would never do otherwise, and demanded to know why it was necessary for us to listen to this. And to know we'd be doomed to do so every summer. In her quiet way, she replied that perhaps once a year isn't too often to recall these fearsome times in our history. At the time, I wasn't sure how I felt about that, but now, I'm, shocked to discover that I look forward to this annual observance, which comes this weekend. Why? I guess after three years some of the shock has worn off. Of course there's more: as usual when I listen to Aliza, I've had to think harder. One thing I've realized is that this day, ignored by most Jews, is a kind of anchor -- keeping us in place, connecting us, those who came before, and those who will follow. I can't trace my family past my grandparents on either side; all my grandparents and their siblings came here years before the Holocaust and any records of their ancestors were lost or destroyed as the Nazis decimated Europe. That they were Jewish, though, is irrefutable. Now I find that, although I can't share their stories and traditions, we do share a history. I realize as I am writing this that moments which commemorate that common history are not just religious, but also family connections. Our mourning on the 9th of Av honors not just God's anger, which led Him to allow the destruction of the Temples, and not just the martyrdom of so many, but also each individual, unknown person whose DNA is mixed with mine. 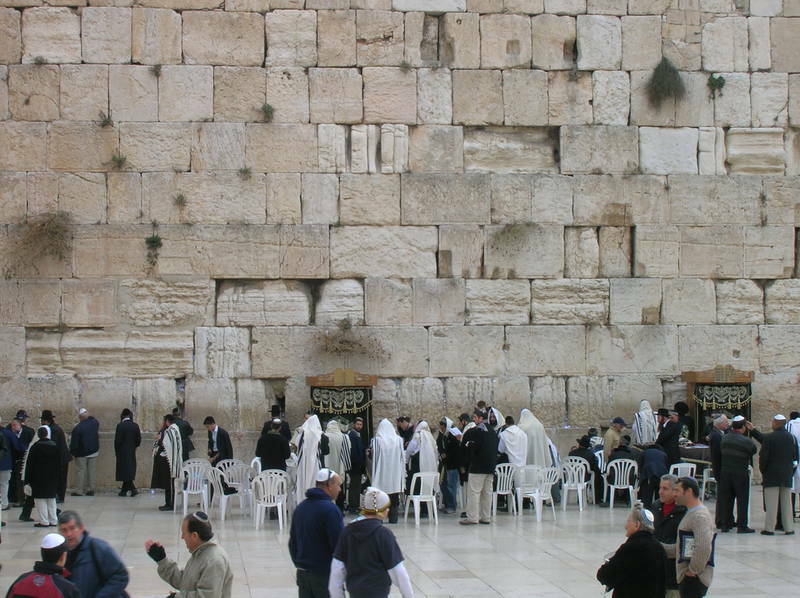 I had often protested that we need to honor that which we value as the positive attributes of the Jewish experience, not just the martyrdoms that remind us of our history of suffering, but also the joy and pride our tradition offers. What I've realized is that we can't forget.. There's much to be learned by what's come before and by acknowledging our connection to it. And this deeply moving, haunting and humbling tradition is connected to each of us right now, this minute. In the time of Moses, the "sin of the spies" whom he sent out to evaluate the situation in the soon-to-be conquered Canaan and who returned with horror stories that questioned God's power to protect the Jews and caused Him to decree that none from the generation who went out of Egypt would be permitted to go into Israel. I am now a member of a Blog Carnival called Haveil Havalim, a community of Jewish bloggers submitting posts of interest to the community interested in Jewish issues. Today's link, my first appearance, is called Daled Amos. You'll find it interesting, I think. And if you want to know what the words mean, read this, written by the founder. Meanwhile, take a look. Blogging Boomers are back at I Remember JFK this week. You can read about everything from saving gas by figuring out the "walkability" of your next apartment, to child-free vacations to prostate cancer. All it smart, unique and useful. Stop on by.